Glassco Mold Release is durable film lubricant used on the glass-contacting surfaces of forming machine tooling. It is sprayed on rings, blanks, baffles, molds, bottom plates, plungers, thimbles, and funnels before installation on the glass-forming machine. Glassco Mold Release® is a water-based material that contains special binders and high temperature release agents. This solid coating is smooth and abrasive resistant and molten glass will not adhere to the coating. This assures a glass container that has a contamination free finish and will result in a reduction in ware loss due to less frequent swabbing which will improve percent pack. Less swabbing will extend the cycle life of the forming machine and tooling. Before coating clean the tooling with electro-etch caustic solution, sandblast or glass peen the forming machine tooling. It is not necessary to polish the tooling. Apply the coating with a spray gun in a paint/spray booth at room temperature. The parts should be air dried at room temperature or during the normal pre-heating of the tooling. For best results, the coated parts should be heated to above 150 °C for 20 to 30 minutes. The desired coating thickness is 0.0005 to 0.002 inches (.013 to .051 mm). Glassco Mold Release® will remains effective for approximately 24 hours without swabbing. To extend the coating life for 3 to 5 days by periodically swabbing with non-smoking or oil based swabbing compounds. If the Glassco Mold Release® is misapplied or damaged the coating can be removed with water and re-applied. After coating the tooling avoid any contact with water. 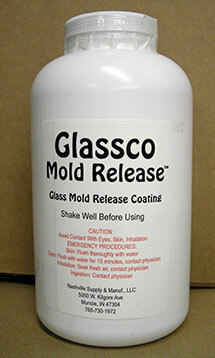 What sets Glassco Mold Release® off from the other products? Glassco Mold Release® is produced from the original formula created in Muncie, Indiana by Ball Corporation. Robert Miller upon retirement from Ball Corporation’s Research and Development worked with me for twenty years sharing his vast experience developing the mixing technique while stressing the need for stringent quality control. Glassco Mold Release® delivers the consistency that manufactures depend on.